If you want to Google to our location, use address 4004 Mesa Road, Irvine 92617. Drop off and pick up can be done on the third floor of the Mesa Parking Structure. From here, students may access the pedestrian bridge, located to the right of the elevator and staircase, to cross to the Arts campus. 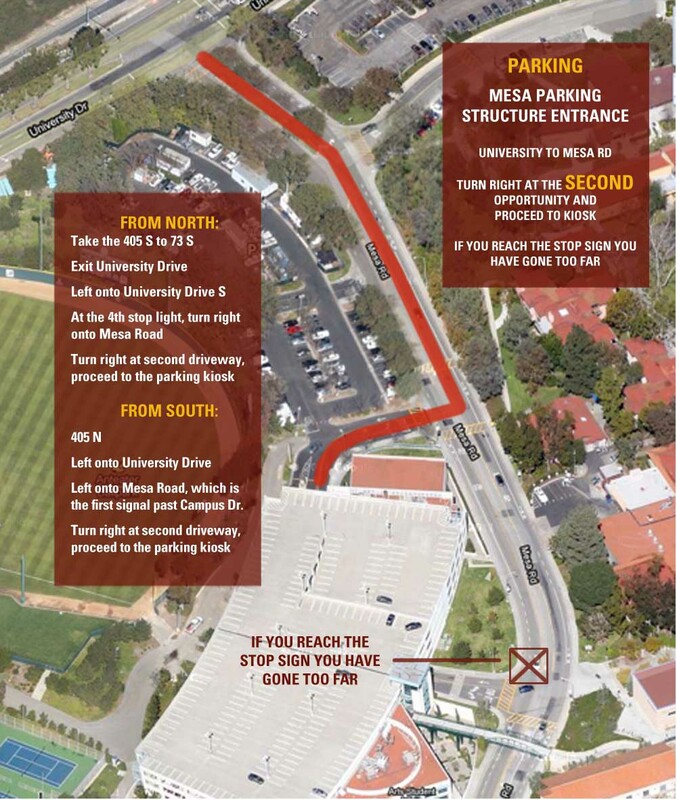 Parking is available at the Mesa Parking Structure building, across the street from the Arts campus. Permits are available for purchase at the first floor entrance for $2/hour or $10/day at any space not labeled “Reserved”. Please also note that parking fees here can range from $10 - $15 per vehicle, depending on Bren Center events taking place next door. Parking regulations are strictly enforced on the UCI campus. All vehicles must possess a valid permit while on campus.